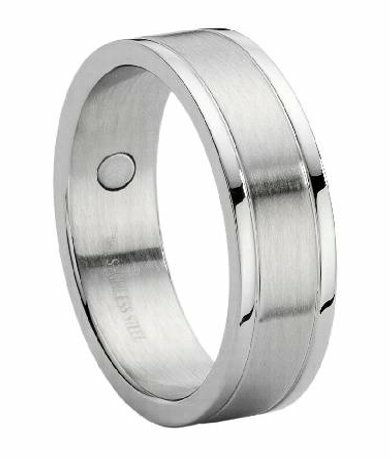 For the guy who wants a little something extra in his wedding band, a stainless steel ring for men that feels as good as it looks. 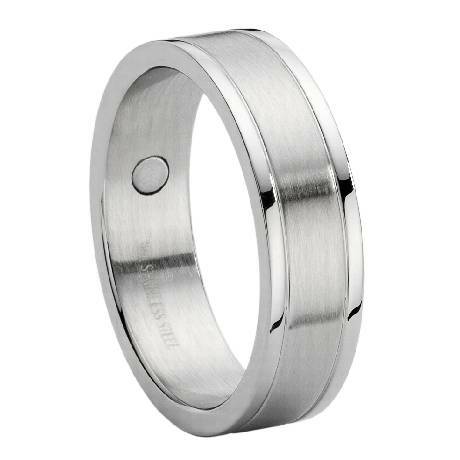 This 8mm wide stainless steel wedding ring has a satin finish center offset by highly polished edges, with three inlaid therapy magnets lining its interior. A contemporary flat profile and traditional fit complete this unique ring. Seriously, I really do love this ring. It looks really nice and more expensive than it was. It is a lil bulky but that is how I wanted it. It is the right width. This could have been my initial wedding band and not a replacement. Great! The ring looks like whats on the photo. And it arrived on the expected date. Thank you! The ring was exactly as shown, and the quality was great! This ring is nearly identical to the real white gold ring my Wife bought, only this one is sturdy enough to wear every day. I'd definitely recommend to others! 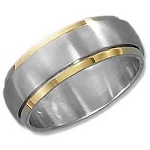 My husband is allergic to his real wedding band and found only stainless steel works for him. He lost his last cheap stainless steel band so I bought this to replace it. Both were the same price range but the quality of this ring is far superior. This ring looks extremely expensive and is thick and heavy. I was amazed when I opened the package how gorgeous it is. Unfortunately I will have to exchange it anyway as the band is too wide for my husbands finger and rubbed against his other finger when trying it on. Keep that in mind when you buy this ring - small handed people might need a smaller ring. This ring is heavy duty and beautiful but, you do need the right hand shape to carry it.